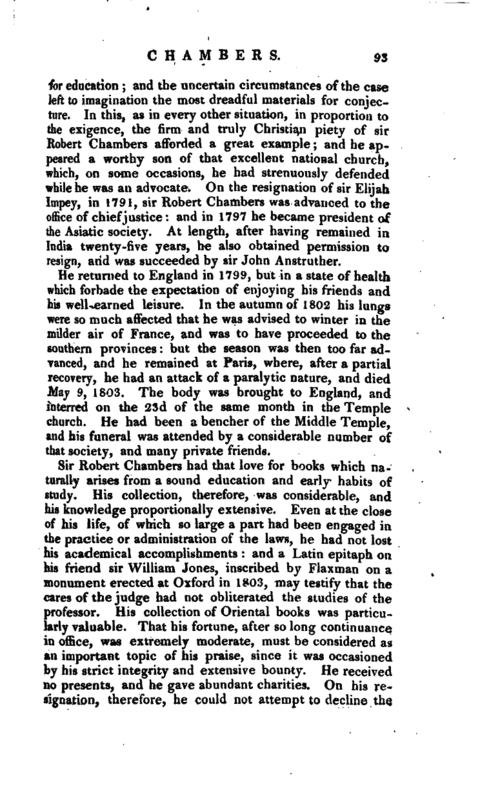 , for several years chief justice of the supreme court of judicature in Bengal, a man of too exalted merit to be passed with a slight notice, was born in 1737, at Newcastle on Tyne, the eldest son of Mr. Robert Chambers, a respectable attorney of that town. He was educated, as well as his brothers, at the school of Mr. Moises in Newcastle, which had also the honour of training his younger friends sir William Scott and the present lord chancellor, whose attachment to him, thus commenced almost in infancy, was continued not only without abatement, but with much increase, to the very end of his life. Mr. 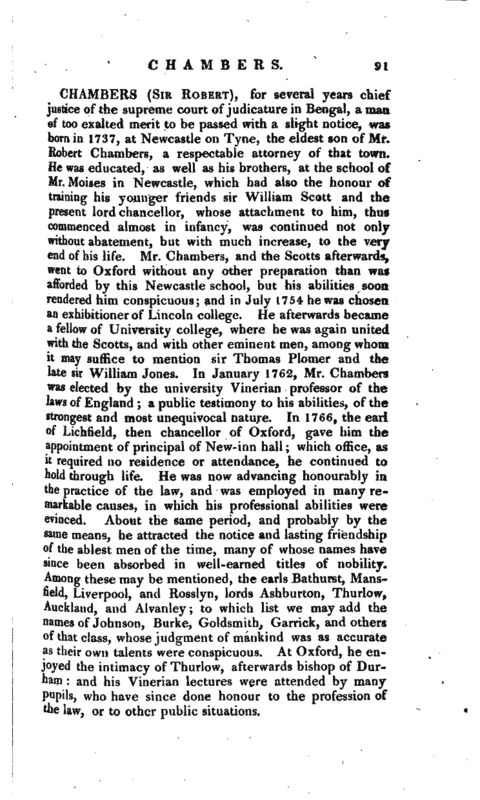 Chambers, and the Scotts afterwards, went to Oxford without any other preparation than was afforded by this Newcastle school, but his abilities soon rendered him conspicuous; and in July 1754 he was chosen an exhibitioner of Lincoln college. He afterwards became a fellow of University college, where he was again united with the Scotts, and with other eminent men, among whom it may suffice to mention sir Thomas Plomer and the ]ate sir William Jones. In January 1762, Mr. Chambers was elected by the university Vinerian professor of the laws of England; a public testimony to his abilities, of the strongest and most unequivocal nature. In 1766, the earl of Lichfield, then chancellor of Oxford, gave him the appointment of principal of New-inn hall; which office, as it required no residence or attendance, he continued to hold through life. He was now advancing honourably in the practice of the law, and was employed in many remarkable causes, in which his professional abilities were evinced. About the same period, and probably by the same means, he attracted the notice and lasting friendship of the ablest men of the time, many of whose names have since been absorbed in well-earned titles of nobility. Among these may be mentioned, the earls Bathurst, Mansfield, Liverpool, and Rosslyn, lords Ashburton, Thurlow, Auckland, and Alvanley; to which list we may add the names of Johnson, Burke, Goldsmith, Garrick, and others of that class, whose judgment of mankind was as accurate as their own talents were conspicuous. At Oxford, he enjoyed the intimacy of Thurlow, afterwards bishop of Durham: and his Vinerian lectures were attended by many pupils, who have since done honour to the profession of the law, or to other public situations. | It is a strong proof that his knowledge and talents were highly estimated at an early period, that in 1768, when he was only thirty-one years old, he was offered the appointment of attorney-general in Jamaica, which, from various considerations, he thought proper to decline. From this time he continued the career of his profession, and of his academical labours, till, in 1773, another situation of public trust and honour was proposed to him, which he was more easily induced to accept. This was the appointment of second judge to the superior court of judicature in Bengal, then first established. On this occasion, the esteem, and regard of the university of Oxford for their Vinerian professor was fully evinced. The convocation allowed three years for the chance of his return, from ill health or any other cause: during which interval his office was held for him, and his lectures read by a deputy. Immediately before his departure for the East Indies, Mr. Chambers married Miss Wilton, the only daughter of the celebrated statuary of that name, and his mother, Mrs. Chambers, a woman of uncommon virtues, talents, and accomplishments, undertook the voyage with them, and continued an inmate in their family till her death, which happened in 1782. They sailed for India in April, 1774; and the climate not proving unfriendly, the Vinerian professorship was in due time resigned. The honour of knighthood was not conferred on Mr. 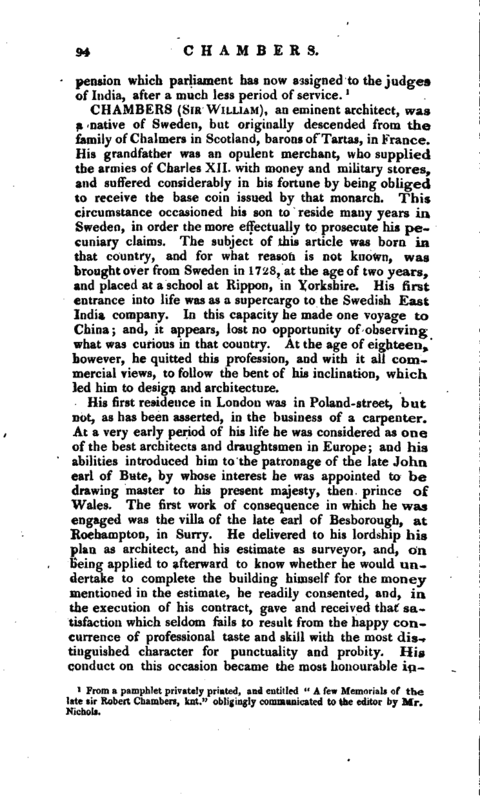 Chambers at the time of his appointment, but, within four years after, was sent out to him unsolicited, as an express mark of royal approbation. How well his original nomination, and his subsequent advancement to the office of chief justice were deserved, it is not necessary here to demonstrate. They who acted with him, or were present in any arduous discussions, can bear witness how often his mild but convincing arguments contributed most essentially to the public service. Without taking a violent part in any contentions of politics, sir Robert Chambers was steady in pursuing the course which his mature judgment approved; and, in all the struggles that arose, no opponent ever ventured to insinuate a doubt of his integrity. The unfortunate loss of the Grosvenor East Indiaman, in 1782, was a calamity in which the private share of sir Robert Chambers was disproportionately heavy. He lost his eldest son, a promising youth, then going to England | for education and the uncertain circumstances of the case left to imagination the most dreadful materials for conjecture. In this, as in every other situation, in proportion to the exigence, the firm and truly Christian piety of sir Robert Chambers afforded a great example; and he appeared a worthy son of that excellent national church which, on some occasions, he had strenuously defended while he was an advocate. 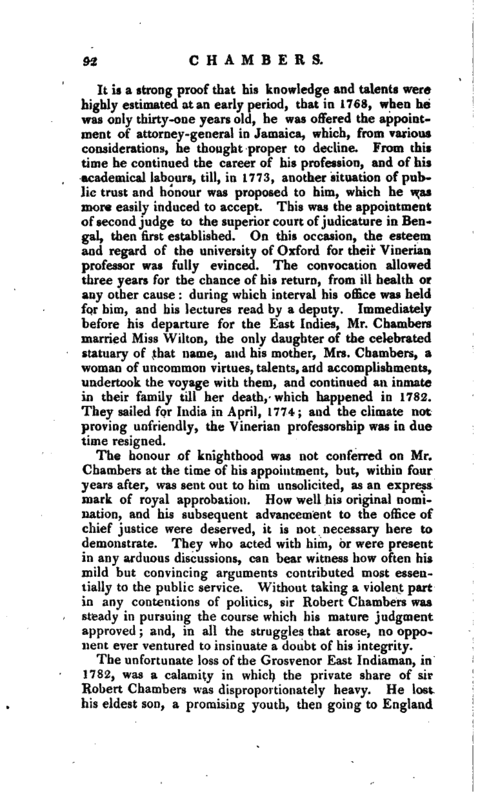 On the resignation of sir Elijah Impey, in 1791, sir Robert Chambers was advanced to the office of chief justice: and in 1797 he became president of the Asiatic society. At length, after having remained in India twenty-five years, he also obtained permission to resign, and was succeeded by sir John Anstruther. He returned to England in 1799, but in a state of health which forbade the expectation of enjoying his friends and his well-earned leisure. In the autumn of 1802 his lungs were so much affected that he was advised to winter in the milder air of France, and was to have proceeded to the southern provinces: but the season was then too far advanced, and he remained at Paris, where, after a partial recovery, he had an attack of a paralytic nature, and died May 9, 1803. The body was brought to England, and interred on the 23d of the same month in the Temple church. He had been a bencher of the Middle Temple, and his funeral was attended by a considerable number of that society, and many private friends. From a pamphlet privately printed, and entitled “A few Memorials of the late sir Robert Chambers, knt.” obligingly communicated to the editor by Mr. Nichols.